Playlists are one of iTunes’ most useful features, but they can be confounding. In this week’s column, I look at three questions about playlists. I discuss why playlists in folders are suddenly not staying in alphabetical order; I explain how to make a playlist to find all the songs and albums that you have “love” in iTunes; and I show how you can add the same song more than once to a playlist, to hear your favorites more often. Q: I have several playlist folders in iTunes, each of which contains a number of playlists. I have recently noticed that when one of the playlists is edited (when I change or add a song, for example) the playlist automatically moves to the bottom of the playlist folder - i.e. it is no longer automatically sorted alphabetically within the folder. Is there any way to fix this? I received this email right after I had noticed the same problem in my iTunes library. I use lots of playlist folders to organize my playlists by artist, genre, and more. And if I look for a playlist whose name starts with, say, A, I know to look at the top of a folder. But I found that, in several cases, playlists weren’t were they belonged. You can see in the screenshot below that a selection of smart playlists I keep in a folder is no longer in alphabetical order. These smart playlists used to display in alphabetical order. This issue seems to have started with the release of iTunes 12.3, in December. When a playlist is changed, it drops to the bottom of the list, but not always. If you view a playlist, for example, and change its view, then it hops out of order; if you manually add a song to a regular playlist, it does the same. And if you click on a smart playlist, it moves to the bottom of the list as well. However, this only happens in playlist folders. If you have playlists that aren’t in folders, nothing changes. There is a way to get everything back to the correct order: just quit iTunes and then relaunch it. But once you start working with your playlists, they’ll change order again. This is clearly an iTunes bug, and I assume Apple will fix this with the next iTunes update. Q: I’ve been using “loves” in iTunes, and in Apple Music, to keep track of the music I like best. But how can I find all these songs and albums? How can I see all the music I’ve loved so I can listen to it again? iTunes 12 added the “loved” rating; you click the little ♡ next to a track or album to tell iTunes that you love it. This hasn’t replaced star ratings, and you can still use the older system, but for many people, it’s more efficient to rate music using a binary Love/Don’t Love choice. You can also use ♡ in the iOS Music app, and these ratings sync with your iTunes library, if you use iCloud Music Library. You may want to find all the music you have loved to search out more by a given artist, or to download an entire album that features a song you loved when listening to some recommended music on Apple Music. You can do this in iTunes by creating a smart playlist. Oddly, you need to use two conditions in your playlist to find everything you’ve loved: the first is Loved, for individual tracks that you’ve rated, and the second is Album Loved, for entire albums you’ve tagged. Unlike with star ratings, where rating an album gives a sort of soft rating to its tracks, the Loved ratings don’t apply to both songs and albums. Make a smart playlist like this to find all the tracks and albums that you have loved. If you sync this smart playlist to your iOS device - either by syncing with iTunes, or by using iCloud Music Library - then you’ll be able to access it remotely, and it should update as you love new songs in the Music app. And if you ever want to put all your loved songs on shuffle, just start playing the playlist, and then tap the shuffle button (the crossed arrows) in the player pane on iOS, or click the crossed-arrow button in the playlist header in iTunes. Q: I would like to add the same song multiple times to the same playlist in order to hear it more often than the others. How do I do that? 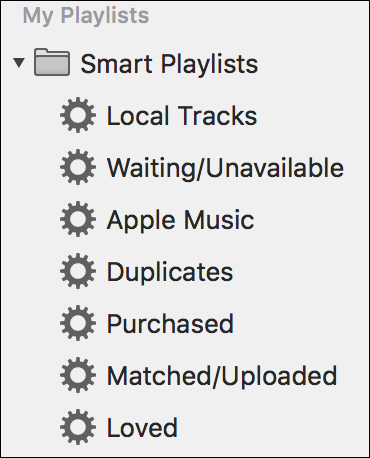 As you probably know, there are two types of playlists in iTunes: there are regular playlists, where you add tracks manually, and there are smart playlists, which, as you can see in the question just above, search for tracks based on conditions you choose. With a smart playlist, the only control you have over which songs it contains is by choose the search criteria. You can’t have the same song more than once, unless you have different albums that contain it (such as a studio album and a best-of album). With a regular playlist, however, you add any songs you want, in any order, even adding the same song more than once. To do this, just drag a song from your Music library to the playlist. Then drag it again. iTunes will display an alert, asking if you really want to add the song again. Click Add, and you’ll have another instance of the same song. iTunes wants to make sure that you really mean to add that song to your playlist more than once. Once you’ve added your song again, you can drag it to change its order in the playlist, so you don’t hear it twice in a row (unless that’s what you want).